Over the last several years, beginning in 2013 I�ve made post titles like �Semi Bullish� in response to the bullish leading edge economic cycle indicator, the Semiconductor Equipment sector and its implications for broad stocks and the economy. Those implications of economic acceleration were along these lines� Semi Equipment Book-to-Bill (b2b) → Broad Semi → Manufacturing → Employment → Firm Economy. Shortly after the b2b was noted as bullish the SOX index and the S&P 500 broke out to new highs, not to even hint at looking back until the rocky 2015-2016 period. Most recently, in December 2017 the wordplay was used tongue-in-cheek to illustrate how we nailed almost to the day the November top in the sector as a mainstream media outlet seized upon peoples� stock market FOMO (fear of missing out), highlighting a fund manager�s claims of great gains in 2018 for the likes of AMAT and LRCX. It is important for someone writing to you professing to have done a good job making calls, to prove it. Hence the links. Let�s also realize that nobody gets it right all the time (HUI�s 2009-2010 �888� technical chart measurement, cough cough� ). Predictably, me being me I now annoy you with another play on words going the other way as there are bearish signs cropping up in the economy�s leading cyclical edge. While the all-important worldwide Semi Equipment book-to-bill ratio is no longer available, other tools are. We are currently tracking a technical signal that will be kept mostly private in NFTRH for now. 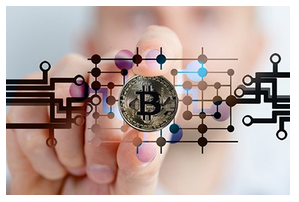 Despite what this article will argue about a potential down move in the sector�s leadership, if not the nominal sector itself, the technical views are the final arbiters because as we know, markets can go against their fundamentals for years. Cue the HUI Gold Bugs index rising amid degrading fundamentals (gold price declining vs. mining cost input commodities in an inflationary cycle) from 2005 into 2008 and the H&S top we called its �crown of thorns� back then. So my question is, if it worked going one way in 2013, why can�t it work in reverse now? The progression of deceleration this time would be� Semi Equipment orders flatten → Broad Semiconductor demand eases → Manufacturing eases * → Employment weakens → Soft Economy. Again, I say to you that if I was putting out the bullish stuff at appropriate times, as documented, I have every right to hit you with the bearish stuff as well. Just to show that I am not writing with preconceived agenda. Most people did not listen then (and indeed, had I had the conviction to go all-in behind the bull view in 2013 I�d be fabulously wealthy now; but I have a vulnerability known as a significant distrust of the Fed, which was the monetary stimulator of the time). Water under the bridge. * As for the �manufacturing eases� component of the progression, we�ve already noted some issues developing there. 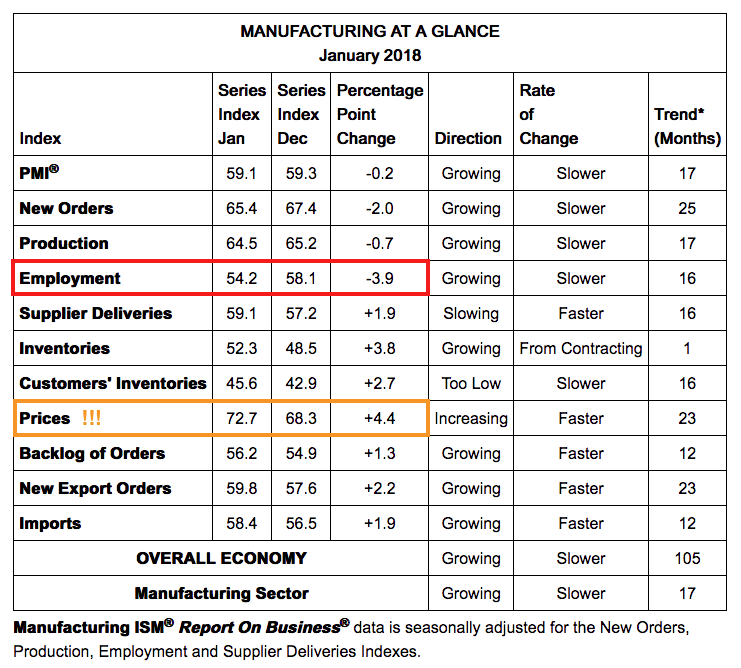 Manufacturing activity was fine in January as New Orders eased a bit and PMI barely budged. However, the �inflation effects� component, prices, lurched higher. At the same time Employment eased more than just a teeny. That is a concern because based on my experience in manufacturing when materials like these start increasing in price, people start having their wages compacted or start getting shown the door. How about good old Bitcoin and its crypto friends? After all, Barron�s tells us that Bitcoin Will Boost Semiconductors Through 2018. That was the type of �everybody to the GREEN side of the boat� stuff going on in 2017. There is plenty more material out there where that came from, indicating secular and unstoppable growth in the usage of Semiconductors. Here is one from my #1 information source, SEMI. 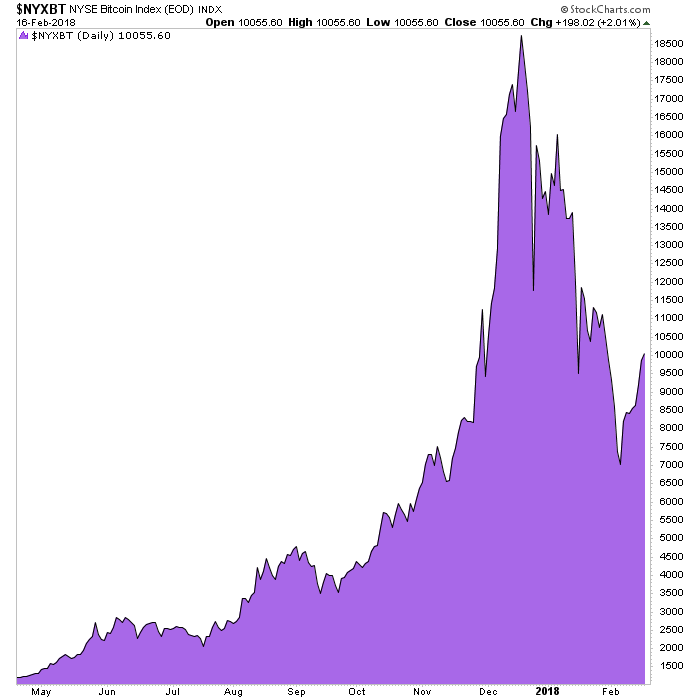 You should read the whole piece (it�s not long) and consider �what if?� with respect to a fading of the Crypto mania. SEMI is in the business of compiling the data and making projections (key word �projections�), not analyzing the long-term viability of the Cryptos or any other industry-driving technology. But Semiconductors have been key to the iPhone, which came along about a decade ago and took the world by storm, spawning all manner of competitive devices and and ever-growing list of tools and applications. Then the �internet of things�, another wonderful pitch by the suits. Basically, it means stick a chip in it and have it access the internet and perform functions. Great stuff, but we are talking about growth curves here. Apps, games, cars and whatever else bright minds will think of to interconnect will all be part of it. Communication, Automation, Robotics, etc. have made great strides and are steeped in innovation. I am not trying to discount that. I am simply stating that the laws of economics still hold and one of those laws is cyclical demand vs. supply. Well, how about the hard data already being gauged by industry watchers? Again, I don�t mean the slick guy in the tailored suit who really wants you in and bullish. I mean real industry analysts. I call the Semi Equipment sector a Chirping Canary for a reason; it�s early, potentially very early. So we are looking ahead, not getting scared or hysterical. Just logically using something that indicated positive outcomes in 2013 and 2016 and is a would-be gatekeeper to negative outcomes moving forward. Now, maybe it�s different this time and I am an old has-been. But maybe not. 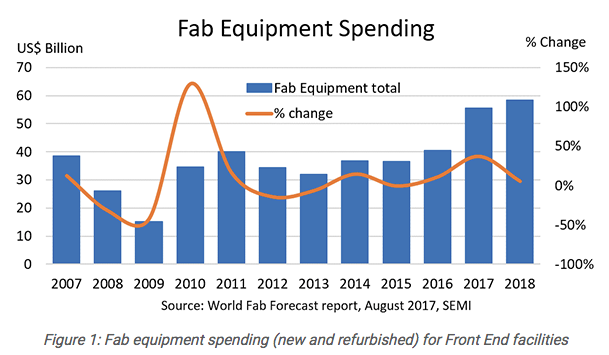 The World Fab Forecast report, published on December 4, 2017, by SEMI, is modeling that fab equipment spending in 2017 will total US$57 billion or 41 percent year-over-year (YoY) growth. In 2018, spending is expected to shoot up another 11 percent at US$63 billion. 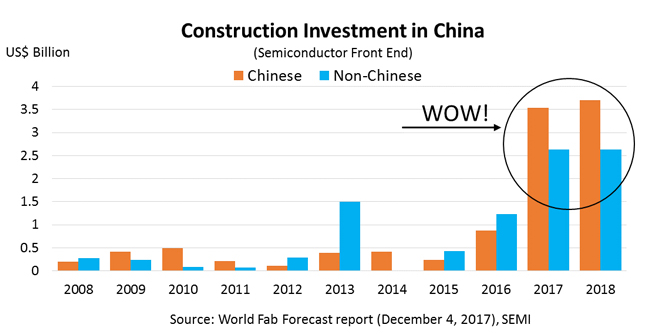 The two spending jumps in 2017 and 2018 are contributing to the �WOW� factor and to two consecutive years of record fab investments. Following historic large investments, some slowdown is expected for 2019. Here is the article from November 21st where we first noted the wrong-headed media hype headline (about �even bigger winners for 2018�) amid slowing growth projections. Why it�s simple. Just as it proved helpful in January of 2013, against the prevailing bearish views of that post-Fiscal Cliff time period� and just as it proved helpful in early-mid 2016 against the prevailing bearish views about Brexit and the implications of the global NIRP regime� it is helpful now to keep an open mind against the prevailing attitudes. From January of 2013 it would then seem like forever and a day until the economy would be universally acknowledged as healthy. So again, let�s not get in a bearish uproar. Indeed, my view leans bullish on general stocks after we are clear of the current correction potential. But the Canary may be chirping.